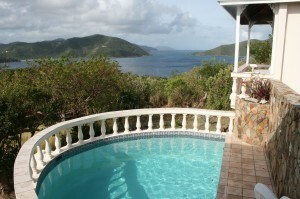 Relax in the comfort of our spacious private villa in a wonderfully secluded setting with spectacular views. Wonderfully secluded Caribbean style villa is set on two + acres of privacy amidst lush tropical plantings- from exotic orchids to a mini plantation of banana, plantain, mango, papaya, etc. Discover the fun of exploring the private island of Great Camanoe in your own golf carts and discover tucked away treasures, sunset overlooks; hidden bays,etc. Enjoy the adventure of taking the helm of your own well maintained boat parked in your own slip in the protected community boat basin, set off explore other islands in the BVI. 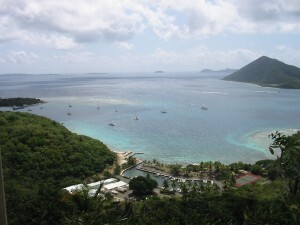 From Great Camanoe, it is a quick trip to Trellis Bay, Beef Island, Marina Cay, and Scrub Island- and you are halfway there to either Jost Van Dyke or Virgin Gorda. The open living floor plan blends the comfortably furnished living room, dining room and kitchen with the expansive, ever changing views of sunrise to sunset, and magical night skies. The verandah and patios offer spectacular views of more than a 300-degree view of sunrise and sunset and more. in addition, act as the common gathering place for end of day libations and delightful dinners. The wonderful vista of yacht watching, weather watching, or star gazing, you will be fascinated by the constantly changing panorama. The view by day is sailboats, wind surfers, yachts, square rigged sailing ships, cruise ships and planes, and in the right season-whales. 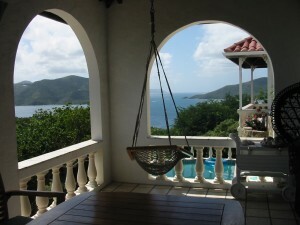 You can see 35 islands including Tortola, Virgin Gorda, Jost Van Dyke and St. Croix in the distance. By night, the twinkling lights of the magic islands and cruise ships passing by that seem to float in the sky. 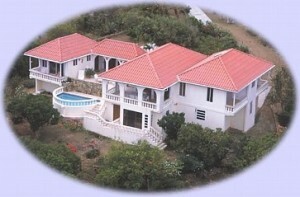 Built in 1987 and still owned by the same family, the villa has a large living-dining room-gathering area. The completely equipped kitchen has a dishwasher, stove, microwave, refrigerator with icemaker, bar sink, island counter with stools. There are three large bedrooms (two with four-poster beds), each with private bath, its own unique view and balcony. Each bedroom has its own private bath and porch for the ultimate seclusion. Living in an open designed style Caribbean house, you realize you are in the beautiful natural climate day after day… no need or effects of air-conditioned living. The intimate pool awaits many dips a day or a refreshing swim after a day at the beach, or simply floating while enjoying a good book. The Island… Explore the fascinating island of Great Camanoe on foot or by golf cart. 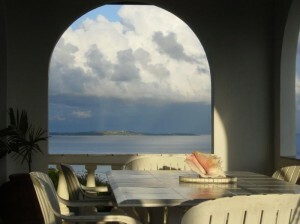 The villa is located on the western end of Great Camanoe Island, overlooking Little Camanoe and the Camanoe Passage. Indigo Plantation, the westerly settlement on Great Camanoe, has 23 houses on some 200+ acres, a community tennis court and boat basin. There are no hotels, stores, or restaurants on the island. All are nearby one-half to 2 miles away by boat. The Indigo Plantation community has tastefully paved private roads for walking and beach access. There are wild goats, wild orchids, starlit nights, exotic flowers with perfume-like odors, shell covered beaches, snorkeling on fabulous coral reefs teeming with tropical fish, 700 foot hills, walking paths, magnificent views, wonderful breezesand days full of all the above or just the complete privacy of the villa. Two golf carts are included for on island use. The beach is about 1/3 mile by golf cart or on foot. A handsome recently updated community tennis court is situated beside the boat basin with a breeze and a view.The Boat… A well-maintained 18.5-foot Scout center console boat with T-top and a new 2016 four stroke 115 HP engine provides adequate transportation to get you to nearby restaurants, gorgeous beaches, limited shops and taxis to Roadtown and the rest of Tortola or just visit and explore nearby uninhabited islands. Because this is an out island, boating skills are a must, unlessyour party is content to stay on Great Camanoe and rely on transportation on a fee per trip basis. For those who really want to explore more distant islands, a rental service of larger powerboats is available on Tortola.The protected, scenic boat basin offers safe dockage for the boat and easy access to nearby island resorts of Marina Cay and Scrub Island, or Trellis Bay. and to explore nearby secluded beaches, bays and waters. 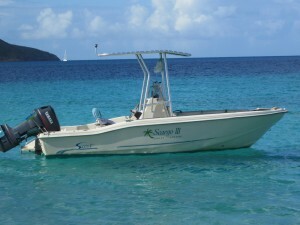 Venture to other islands, reefs, bays, beaches and more in the 18 ft boat. Nearby you can reconnect with the funky or upscale for shopping, lunch, happy hour, dinner, etc at Marina Cay, Scrub Island Resort or the restaurants and bars of Trellis Bay(easy access to the airport as well).The Sea Life… Experience world class snorkeling… Great Camanoe is surrounded by some magnificent, world-class reefs- wonderful coral formations, exotically colorful reef fish in the unforgettable Caribbean blue waters – a snorkeler’s paradise. Find that special shell waiting on the solitary beaches and shores. Whether exploring the waters snorkeling, boating, fishing, walking a beach or just watching the view, you will have unequalled memories of the nearby sea life.It’s Easy to Get There… Fly into Beef Island, Tortola (EIS) and walk to the dock where our Manager will meet you in the boat and accompany as you cross to Great Camanoe and help to get you settled into the house. Air travel via San Juan to Tortola (Beef Island) or ferry from Saint Thomas is recommended, with arrival at the Trellis Bay dock before dark a must. .Vacationing on a private out island, you will experience a renewal of appreciation of the beauty of a truly virgin area.